Debuting with the Yankees in 1936, Dimaggio is only athlete in North American pro sports history to be on four World Championship teams in his first 4 full seasons. In 1941 he established a record that most think will never be broken when he hit consecutively in 56 straight games. He was also the first pro athlete to sign a contract for $100,000 in 1949. 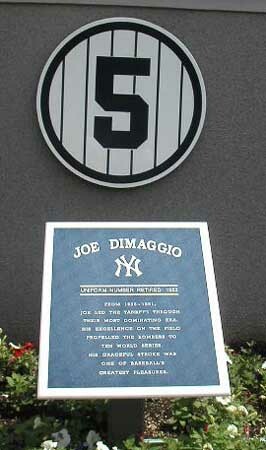 His number 5 has been retired and Dimaggio is immortalized in Yankee Stadium's Memorial Park.